This Wasteless dip is inspired by my Greek heritage. Skordalia is a popular dip which can be made with stale bread or potatoes. My favourite is the one using bread. It is a kind of bread sauce, brought to life by walnuts, sharp vinegar flavours, garlic and extra virgin olive oil. It is traditionally served with deep fried salt cod and once you start you can’t stop eating it. At Wasteless suppers we usually serve it with smoked paprika temperate vegetable and cucumber slices. 1. Soak the bread slices with the crust in some water until soft. 2. Squeeze out the water well with your hands and place in a food processor. 3. Add the garlic cloves crushed. You can add more garlic but the longer you leave the dip in the fridge the stronger it becomes. 4. Top with the walnuts, salt and pepper/nutmeg and olive oil and blitz until lovely and creamy. 5. Taste to adjust the salt and vinegar levels. The vinegar really makes this dip special so if you feel something is missing add another teaspoon. 6. This dip is absolutely delicious with raw vegetable, as an accompaniment to salads, with tempura vegetable and fried fish (in the traditional Greek way). This entry was posted in Food waste reduction, Greek cuisine, Recipes, Vegan, Vegetarian and tagged food, Greek cuisine, greek food, liaskitchen, lovefoodhatewaste, skordalia, wasteless, WasteLess cardiff, WasteLess Suppers. Getting down your greens is a very important step of keeping healthy during winter! Kale is a member of the brassica family and has great nutritional value. From high levels of iron, vitamin K, C and A, to anti inflammatory benefits it’s a food both accessible, locally grown and often organic. Kale can help you increase your greens intake in easy and tasty ways. Make a pledge now to eat more veg any time of the year. Follow the #vegpower campaign for inspiration. Here’s an easy recipe to get you started – Kale with spaghetti. When Zöe Rozellar walked into our kitchen with this idea of cooking kale it opened so many possibilities! You can also enjoy the kale as a side, for breakfast with egg (Zöe’s favourite) or with rice/couscous/quinoa. You may also add raw or cooked mushrooms to this dish – the red elf cup mushrooms from Blaencamel market stalls were a treat with this dish. Wash the kale, pull leaves off the harder stalk (if not tender) and drain. In a big baking tray dress in 1/2 tsp salt, the sesame and a couple of generous lugs of olive oil. Massage well so that oil and salt dress all leaves. Bring water to the boil for pasta adding salt and oil. And preheat the oven to 180 degrees. At the same time you start boiling the pasta, add the kale in the oven after you cover the tray tightly with aluminum foil. The kale should bake at least for the duration of your pasta preparation. Once the pasta boils and is in the colander, return the pot to heat, cover its base with olive oil and add the two cloves of garlic roughly chopped. Lower the heat and stir fry the garlic till softer – a couple of minutes – taking care not to burn. Add the paprika, nutmeg and 1/2 tsp of pepper and stir fry for about half a minute or so. Add the spaghetti and a pinch of salt. Toss well to dress in spices. Remove the kale from oven, add to pot and stir well. Remove dish from heat and add the crumbled cheese. For a vegan version add Dukkah or roasted and crushed hazelnuts instead of cheese. This entry was posted in Recipes, Vegan, Vegetarian and tagged blaencamel farm, Cardiff, food, greens, kale, Lias Kitchen, liaskitchen, organic, recipe, recipes, veg power campaign, Wales. On 14 October 2017 the first and pilot WasteLess dinner took place in the heart of Cardiff at LittleMan Coffee Company Café. It was fun, it was epic, it was inspiring and most importantly it was tasty! But what is WasteLess and why am I telling you about it? Book your seat on Wasteless 2018 here now! WasteLess is a collaborative pop-up event which involves more than one food businesses in the delivery of a feast using food surplus, food that would have been wasted and food that is produced in a less wasteful manner. The pilot WasteLess feast collected over forty kilos of food that would have been wasted in the week leading up to the event. The food was then safely handled, stored, distributed and cooked by the participating chefs/businesses and volunteers to offer a five-course feast presenting eleven dishes. All participating chefs and cooks contributed ideas to the menu as collections went along. WasteLess tapped into their culinary culture, business practices and the creativity of their teams to bring a wonderful menu together . I co-run WasteLess with Rebecca Clark from Green City Events. And after years of working together on food waste reduction projects through community cook ups with food destined for the bin, roadshows, school lunch clubs and pop up street food stalls, we wanted to set up a platform that helps local businesses tap into their creative and sustainable practices and to showcase elements of Cardiff’s existing and emerging ‘wasteless’ food movement. There are many fantastic businesses already doing great things and many more who could be supported to do more. We want to bring new businesses to the table and to inspire and assist them in taking a wasteless approach. The fantastic businesses which contributed to the first WasteLess event include Penylan Pantry, a sustainable café and grocery store which implements the low-waste approach in its practices; Mezza Luna, an award winning, independent, Middle Eastern restaurant; the Little Man Coffee company, an ethical coffee shop which is a hub of community activity and of course, moi, Lia’s Kitchen. Many more were involved in other ways. The Cheese Pantry donated cheese close to its use by date. TOAST Ale provided the event with beers and ales brewed from bread that would have been wasted, The Bottle Shop Cardiff advised on the sourcing of ethical wines and Get Wonky Juices, donated their delicious juices made from ‘scrap’ fruit and veg. It is not just the businesses that we worked with that really believe in what we do. Celine Anouilh from the Chartered Institute of Waste Management in Wales said, ‘ I much enjoyed this first WasteLess dinner raising awareness of food waste. Lia and Rebecca used of the right ingredients to produce a taste meal and an inspiring event: a partnership between enthusiastic and ethical businesses, forgotten food from super markets shelves, great cooking skills, creativity and passion! I ate a delicious meal, met wonderful people. CIWM Cymru wishes every success to this fantastic project and look forward to attending the next dinner’. The October event was just a test to see if our WasteLess vision is truly possible. We are now ready for the next step. Partly supported by Sainsbury’s Waste Less Save More fund Green City Events and Lia’s Kitchen will help deliver more WasteLess events in 2018. The first WasteLess dinner entertained thirty guests and raised over £600 for Cystic Fibrosis in memory of Tom Woollam (Better Life Appeal Llandough Hospital). We would like to thank all businesses who donated prizes to a charity raffle: John Lewis, Snact, Get Wonky, HangFire Southern Kitchen, Milgi Cardiff, Penylan Preserves, Colourfiled, Twin Made, Nelly’s Treasures, Ellicopter Hoops and Sustainable Studio. Lia Moutselou, Lia’s Kitchen and Rebecca Clark from Green City Events co-design and co-run WasteLess. Our partnership on food waste and ethical ventures is well established. Over the three years we joined forces to deliver a series of food waste projects and initiatives in Cardiff, in collaboration with Love Food Hate Waste campaigns and other local organisations and businesses. From community cook ups with food destined for the bin, to roadshows, school lunch clubs and pop up street food stalls, we have inspired, engaged and educated to encourage action and behaviour change relating to food waste. Sign up to our mailing list for future WasteLess events or email liaskitchen@gmail.com. This entry was posted in Comment, Events, Review and tagged Cardiff, food, greencityevents, greenfood, liaskitchen, lovefoodhatewaste, lttileman, october wasteless, popup, Wales, wasteless, wasteless dinners, wastenot, wastereuction. Whilst I may have skipped a month of sharing recipe ideas with you inspired about one of my favourite places in Wales, it seems that the summer crop that has done so well on Blaencamel Farm’s land this summer keeps going strong this first week of September. 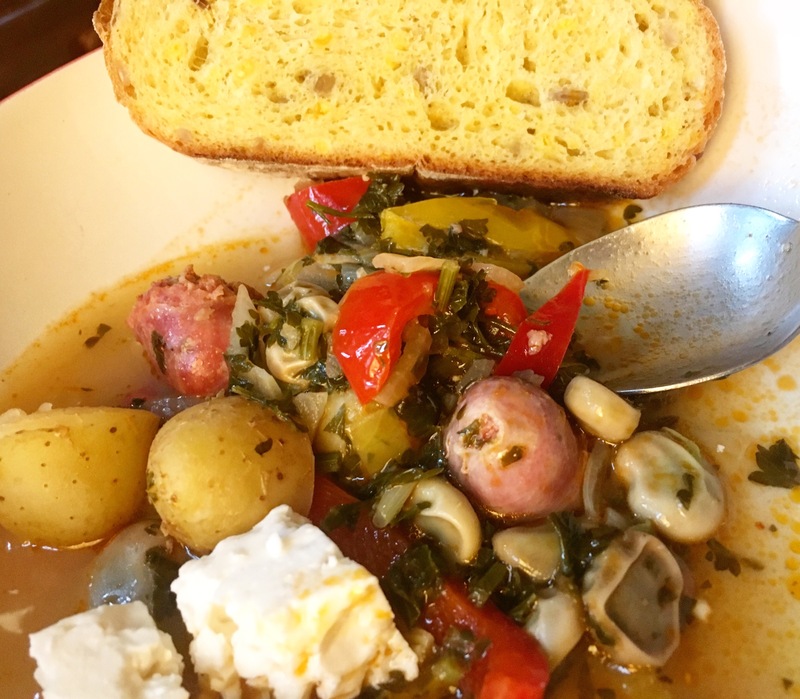 This year the almighty broad bean has inspired various summer version of one of my favourite Greek dishes, Spetzofai, a stew which hails from beautiful Pelion on the Greek mainland (the land of the Cyclopes). This simple sausage stew requires flavoursome, good quality sausages containing at least leek with a hint of spice, fresh seasonal vegetable and beans. The freshly podded broad beans make for a lighter and quicker version of the dish. To replace the broad beans chose either giant (Lima/Butter) beans or cannellini. As I am always inspired by my Greek heritage, Welsh producers and my local farmers’ market so I recommend you use Charcutier’s Italian fennel or their Thyme sausages for this recipe. The stew follows the same cooking method as the July 2017 Fasolakia dish which is popular in Greek cuisine. You can adapt it to make your own vegan, vegetarian and meat dishes Greek-Stylee. As usual you can source most of the recipes at the Roath and Riverside Farmers’ Market in Cardiff as well as other farmer market locations supplied by the farm in Wales. Coat the base of a wide pot with enough olive oil to cover it. When the oil is hot add the cubed sausage and sauté until browned. Add the onion, peppers, one teaspoon sea salt and sauté until the onion softens. Add the tomato paste or grated tomato and fry for a couple of minutes stirring well. Add the chunky cubed potatoes, beans of your choice and roughly chopped spinach. Stir fry for a couple of minutes until they are well coated in tomato paste and oil. Add the wine and the chopped parsley. Stir well. Add half to one tsp of sea salt and enough boiling water to almost cover the veg and meat (but don’t submerge them). Stir well but before you place the lid on the pot to simmer for around 40 minutes, try to push the meat and potatoes to the bottom of the pot and the beans and courgettes closer to the top so that they steam. From this point on do not stir so that your vegetable does not fall apart when cooked. The dish is ready when the water has reduced but not fully evaporated. Set aside for 20-30 minutes. Or for a real Greek meal enjoy (cold or in room temperature) the next day. Enjoy with a chilled glass of Greek Agiorgitiko Wine . This entry was posted in Greek cuisine, Recipes and tagged blaencamel farm, charcutier, farm to fork, farm to plate, food, greek food, organic food, recipes, seasonal, Wales, welsh farm. On 21 May 2017 Melissa (Penylan Pantry), Sam and Shauna (Hangfire), Bettina (Brød-The Danish Bakery), Goldie (Samosaco), Ericka Duffy (cocktail and taste expert), Ashli (Spillers Records) and I worked together to deliver a unique night of food, drink and music. What united us, apart from our extremely worthy cause to raise money for Action Against Hunger, is our passion about women leading the way in food business and good, ethical, tasty food. We delivered this event under the banner of Meal Squared, a format that delivers collaborative events and which Melissa set up last year to strengthen Cardiff’s growing independent business community. The inspiration for Cooking From the Heartland came from the ‘Severn Sisters’ Bristol dinner organised by Romy Gill MBE and Kim Somauroo in autumn 2016. It involved women from different food cultures to create a female feast. ‘We were so inspired by our experience [of attending the event] that we decided to have our own version in Wales. Our feast, ‘Cooking from our heartland’ is inspired by the international drinks, food and music makers we know and love’, say Sam and Shauna. For me and the other women who were approached to participate in this evening there was no doubt that this was going to be our kind of fun. I would particularly like to thank Oliveology, Blaencamel Farm, Cig Lodor Meat, All Greek Delicatessen, CocoCaravanCocoCaravan for donating ingredients for the mezze platter and dessert I prepared for the event. A massive thanks to all the other women who volunteered and worked hard on the night . And to Kas of Waterloo Tea who gave us access to his amazing restaurant/coffee house in Wyndham Arcade to run the event. Cooking from our heartland means …. This entry was posted in Comment, Events and tagged action against hunger, Cardiff, charity, collaboration, Events, food, greek food, mutlicultural, women, women in business. May is the period of the hungry gap but at Blaencamel Farm where, during this period of summer anticipation , they continue to grow nourishing greens. Gem and pink, and green Battavia lettuce have appeared on the stall. There is spinach, sweetheart cabbage, wild and green garlic. Whilst the seasonal bouquet garni can complement the dill that makes this spring soup so special. May’s recipe is a Greek traditional Easter soup with a Welsh and clean-eating twist! Mageiritsa is traditionally cooked with lamb’s liver and plenty of greens and salad leaves. This is a vegetarian version and could be made vegan if you choose to not use avgolemono, the egg-lemon sauce typical of many Greek recipes. If you live in Wales what makes this Mageiritsa extra special is using dried kelp from Pembrokeshire. And the final Greek note is the use of the tangy and sharp sea buckthorn berry, which is becoming a staple in my cooking this year. Visit www.liaskitchen.com for more ideas and monthly seasonal recipes inspired by Blaencamel Farm’s crops. Coat the base of a deep pot with olive oil and sauté the onion and leeks with one teaspoon of salt until soft and translucent. Add the cubed mushrooms (2 -3 cm chunks) and sauté for 2-5 minutes. Add the finely chopped herbs, wild or fresh garlic and greens, and stir fry for a couple of minutes. Then add the stock, stir well and (if you are using) add the dried kelp or other sea weed, pepper and sea buckthorn berries. Simmer for about 10 minutes and then add the rice. After 20 minutes (when the rice has softened and soup has thickened) remove from the hob. Beat the egg really well until it is fluffy and creamy (around 5 minutes), and whilst you continue whisking gradually add the lemon juice. Take one ladle of hot stock from the soup, strain through a fine sieve and add the hot stock slowly to the egg-lemon mixture whilst still whisking on low speed or by hand. Finally add the thinned egg-lemon and stock juice to the hot soup stirring in well to make sure it flavours and thickens all of the soup. Taste and adjust the seasoning if needed. This entry was posted in gluten free, Greek cuisine, Recipes, Vegetarian and tagged blaencamel farm, food, food blog, Greek cuisine, greek food, greens recipes, lifestyle, mageiritsa, magiritsa, mushrooms, organic, organic greens, seasonal, spring, Vegetarian recipes. 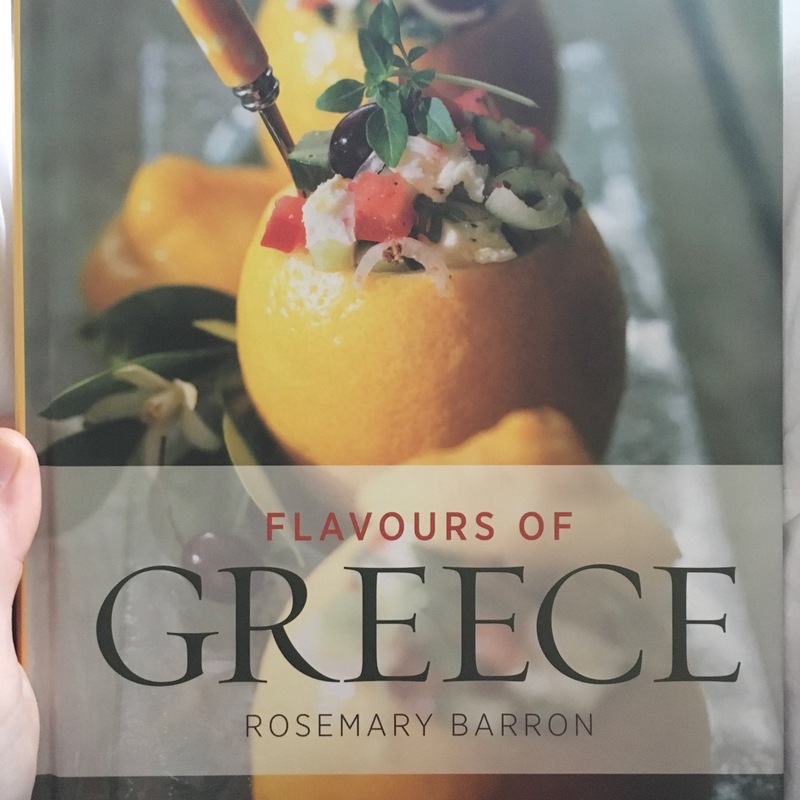 Rosemary Baron is keeping me company with her book about Greece and its food. I love reading others’ take on Greek food and this lady being an archaeologist is a very credible, unbiased source of information. She says, ‘the ancient Greeks regarded cooking as both an art and a science and throughput the ancient world Greek chefs were accorded the status and reputation that French chefs now enjoy. The principles and practice of fine cooking and gastronomy as we know it today were first established in the abundantly stocked and highly creative kitchens of Ancient Greece, and modern Greeks still enjoy the foods and tastes that inspired the chefs of antiquity’. Rosemary Baron goes on to talk about the height of the Minoan civilization and trade with North Africa, which helped create a small garden of Eden in Crete that influenced Hellenistic cooking. At the height of the Roman civilization Greek chefs and teachers were sought after and employed in the Roman homes and kitchens, and according to Baron it seems under their tutelage the amazing, distinct Italian cuisine developed. Then the Byzantine empire helped the influence of Greek cooking influence travel further. And then during the occupation of the Franks, Venetians, Ottomans eastern and other influences arrived, and tribes like the Vlachs brought spices like my beloved paprika. I am certain Greek chefs embraced new ingredients and influences from other cultures. The early Greek diet of olives, wheat, figs, grapes, wild greens, fish and a little meat was enriched with ingredients such as lemons, potatoes, aubergines, tomatoes, spinach, okra introduced by trade, but also war and occupation. The silver lining is that even dark times of occupation were still characterized by culinary and cultural diversity. In her book Baron clearly asserts that the hybridity between Greek, eastern and even Balkan cuisine was mostly nurtured during the more peaceful Byzantine times rather than the Ottoman Empire. But I am sure that the Ottomans have helped many dishes travel through Greek chefs to new parts of their Empire where other cultures also embraced and adapted them. What fascinates me is Baron’s explanation that during Ottoman times Greeks, who were forbidden to speak their own language, were forced to use Turkish names for dishes such as the now famous moussaka, boureki, dolmades, losing the connection of the dishes to their origins. As children we were taught about secret Greek schools during the Ottoman occupation. They were the underground hubs of language that kept Greek alive but I didn’t know that Greek chefs also took refuge in monasteries for their safety and to safeguard centuries of culinary knowledge!!! Apparently there they wore tall white toques which distinguished them from the monks – the toque is now the chef hat and symbol throughout the world. Food and its love travel well even at the worse of times. It is a beacon of hope and should connect rather than divide. What I know as traditional and modern Greek cuisine is a real testament to that, and it is a lot more diverse than just the delicious feta and tzatziki. You can now join my 2017 cooking classes telling you the story of my Greek kitchen. Classes include an Introduction to Greek Kitchen Basics; The Greek Flavours no one is telling you about; The Art of Greek Pie; The Magical Art of spice mixing. You can book online here or email lia@liaskitchen.com. Watch Rick Stein’s programme about Thessaloniki, Greece and its food to find out more about my city of birth and what you might get during our courses: http://bbc.in/2gnRaMQ. This entry was posted in Uncategorized and tagged Cardiff, cooking classes, food, greece, greek, Wales. B E I N G T R E A T E D //@strongholdcoffee doesn’t only make the best coffee @riversiderealfood #roathmarket every Saturday he’s also mean chef. A heartwarming, delicious Monday meal that healed our blues. If that’s his easy, quickly thrown-together meal, I don’t know what to expect next. Wicked squash curry, moorish roast cauliflower and fantastic creme brûlée! #whatatreat #locallegends #worldflavours #food thank you ! W O R L D C A F É// raise your hands 🤚if you have missed our #worldcafe #popups #supperclubs some of the first in #Cardiff. This one was back in 2014 @penylanpantry and I here I am making over 100 #loukoumades , the greek honey dipped doughnuts for our thirty guests! It was quite the way to end our #globalmenu #supperclub #popupdinner! And i cannot forget that beautiful #Portuguese dessert wine from @thebottleshopcardiff #liacooks #liaskitchen #liawrites #globalkitchen #lowimpactfood #worldflavours #greekcuisine #realfood #realpeople #worldcafecardiff #worldcafe #worldonyourplate #worldonyourpalate Click on profile link for the Spotify playlist from that event.